faculty, and was recently established by the AOD and is supported by the AOD’s Founders Fund. Delgado is a clinical assistant professor and the interim director of operative dentistry in the department of restorative dental sciences. Brian Holland, Ph.D., R.N., has been named associate dean for academic affairs. He comes to UF from the Texas A&M College of Nursing, where he has served as the assistant dean for undergraduate studies. Holland’s scholarly interests are in the use of innovative pedagogy in nursing simulation, and of advanced technologies to improve student-learning outcomes. His clinical specialty is in critical care. Stacia Hays, D.N.P., CPNP, CCTC, a clinical assistant professor, has been elected as the American Association of Nurse Practitioners’ state representative for the North Florida Region. Hays will serve as the voice for thousands of nurse practitioners from Orlando to the Florida Panhandle, and advocate for important community and nursing issues. Nancy P. Mendenhall, M.D., a professor and associate chair of the department of radiation oncology, has been named the 2018 Clinical Science Researcher of the Year, in part, for her recent research success in securing an $11.9 million grant for a national prostate cancer study comparing proton therapy to standard radiation treatment. As the medical director of the UF Health Proton Therapy Institute in Jacksonville, she leads the clinical care and research program for this advanced form of radiation treatment. The award is given for research having a close connection with clinical medicine that has a significant impact on the delivery of patient care. Peter Dziegielewkski, M.D., FRCS, an assistant professor in the department of otolaryngology, is the director of UF’s head and neck oncology program’s newly established Advanced Head and Neck Surgical Oncology and Microvascular Reconstruction fellowship. The American Head and Neck Society recently evaluated the program and granted full accreditation to the fellowship. Sara Jo Nixon, Ph.D., a professor of psychiatry and psychology, has been awarded the Research Society on Alcoholism’s 2018 Henri Begleiter Award for Excellence in Research. This award is given to an individual demonstrating innovation, creativity and excellence in their research and/or someone whose work has a major impact on their field. Nixon was also recently named director of the University of Florida’s Center for Addiction Research & Education. Rebecca Austin-Datta, a One Health Ph.D. student in the department of environmental and global health, was accepted into the Centers for Disease Control and Prevention’s Science Ambassador Fellowship program, an educational program for teachers and educational leaders interested in increasing awareness about public health sciences in middle and high school classrooms. Participants complete a five-day course at CDC headquarters and continue to collaborate with the CDC remotely for one year. Mohamed Shahin, Ph.D., a postdoctoral fellow in the department of pharmacotherapy and translational research, has been awarded the 2018 Top Membership Recruiter Award by the American Society for Clinical Pharmacology and Therapeutics for his efforts to grow the membership base. Shahin recruited 10 new members to the organization in the past year. An active member of ASCPT since 2012, Shahin has earned five Presidential Trainee Awards for his research excellence. Years of training and education proved beneficial for 130 graduates of the University of Florida College of Pharmacy, who secured highly competitive pharmacy residency positions in 2018. The stellar showing allowed UF to maintain its No. 1 national ranking in total students matched into American Society of Health-System Pharmacists, or ASHP, residency programs. This is the third consecutive year UF has ranked No. 1 nationally in total residency matches. The ASHP Resident Matching Program includes Postgraduate Year 1, or PGY1, and Postgraduate Year 2, PGY2, pharmacy residencies. 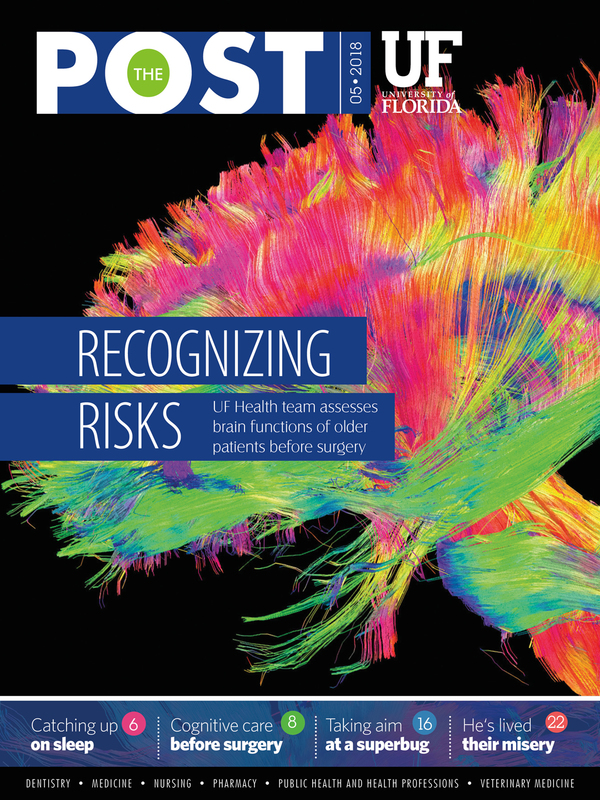 UF’s 130 residency matches included 102 students matching PGY1 and 28 students matching PGY2. From Seattle to Miami, UF pharmacy graduates matched at hospitals and health care facilities in 19 states. The majority will continue their training in Florida, with 84 graduates matching in the Sunshine State. More than 4,800 pharmacy residency positions were available in this year’s match. ASHP uses a mathematical algorithm to pair applicants with mutually interested residency programs. After multiple applications and interviews, pharmacy students and programs rank their preferences before a computer completes the match.